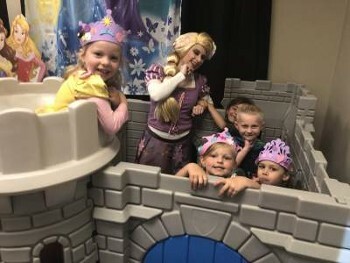 With a Rapunzel birthday party, there will be no more wondering when will her life will begin! When the lights appear on her birthday THIS year, your young princess can expect a Rapunzel birthday party extravaganza. We offer three kid’s birthday party packages to fit your child’s imagination and your budget: bronze, silver, and gold packages. 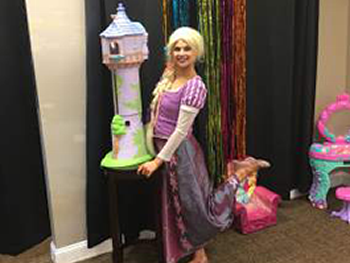 While you let your hair down, our theater-trained Rapunzel and another character of your choice will entertain your child. Our actors deliver superb theatrical performances. What would a Rapunzel Birthday Party be without hairstyling? Our gold package includes hair styling in our salon and so much more. Your princess will get to wear a Rapunzel costume. 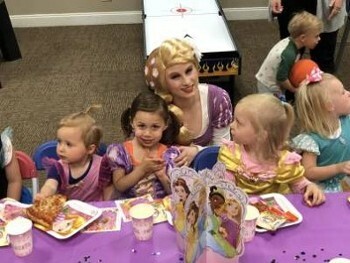 ALL the birthday party guests will get to wear princess costumes, too! Capes and masks for the boys! If you prefer to have a home party, Rapunzel can climb down her golden stair and come to you. 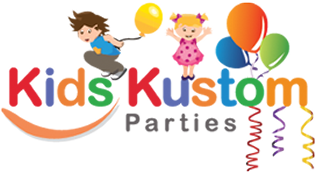 Explore kids party characters at your venue. The Brothers Grimm wrote Rapunzel in 1812. They adapted the fairy tale written and published by Friedrich Schulz in 1790. Walt Disney Animation Studio’s movie Tangled is a loose retelling of the story of Princess Rapunzel.